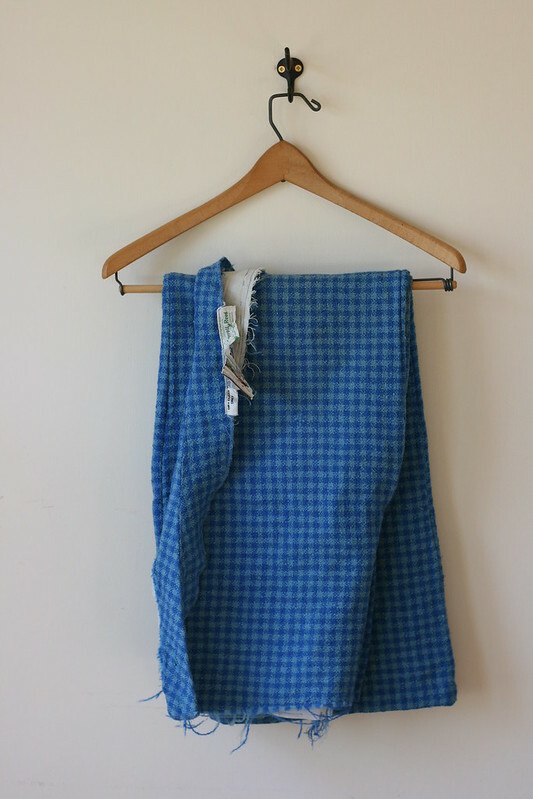 I often reference Alabama Chanin on this blog. 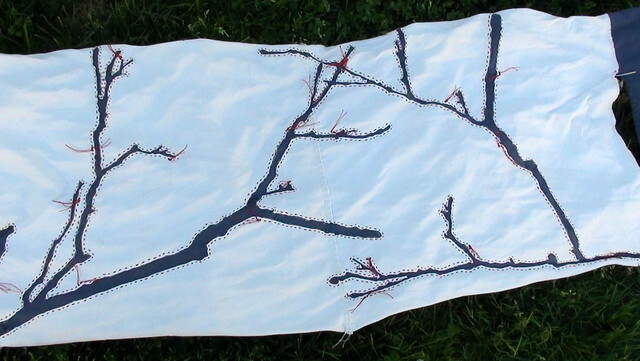 Natalie Chanin and her books have been a huge influence on my sewing. As I was thinking about this, I realized that I had another project I ought to show you inspired by them. This project took me a good month or more to complete and a lot of problem-solving, but it was also a lot of fun. 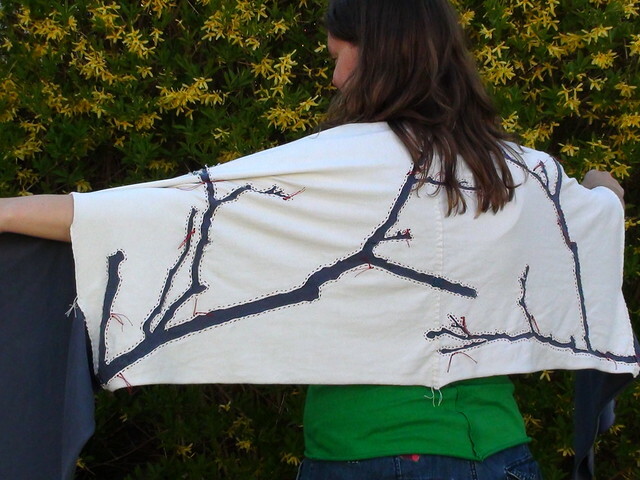 So, today I’d like to show you my Alabama Chanin inspired wrap. Here’s a long view of it. 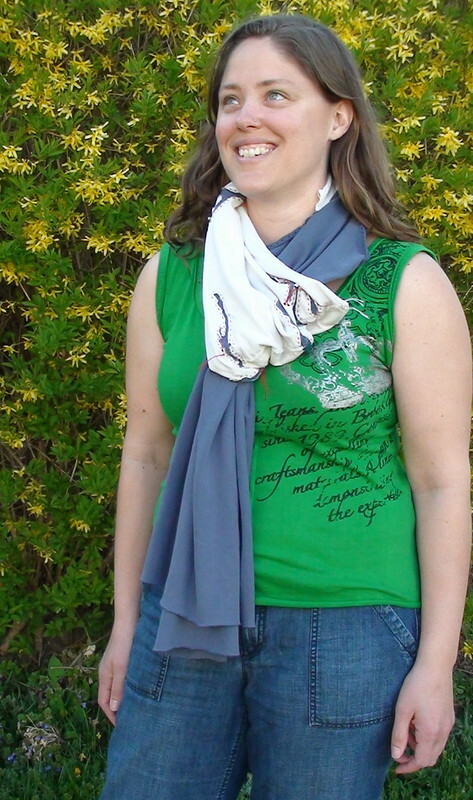 I made this out of two nice, heavy-weight t-shirts that my husband was retiring (well, he was really only retiring one, but I begged for the other one too, so I could have more fabric of the same weight…he’s a nice guy). I cut the largest amount I could from the front and back panels and used the scraps for my reverse applique. That’s the short version. The longer version is that I had to come up with a stencil. I had a branch with a lovely shape, and I traced its silhouette onto poster board. Then I cut the shape out with an X-acto knife. My stencil was fairly fragile since it covered most of the poster board and was only attached at one spot. That will be something to consider if I do this again (making it more stable), but for the first time, I worked with it. 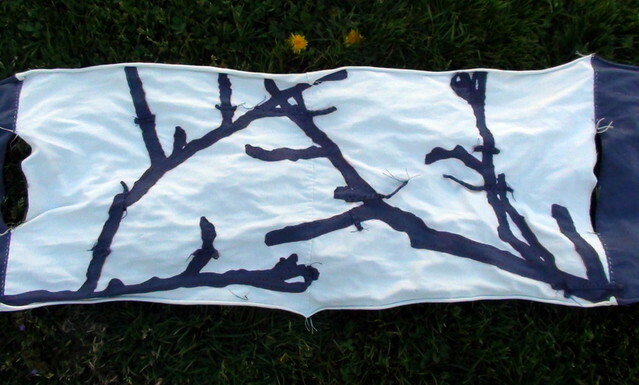 I laid the stencil over the two white shirt panels that I had stitched together and used navy blue fabric paint and a foam brush to transfer the shape of the branches to the fabric. I debated continuing the shape onto the blue panels, but decided not to in the end. Once that was dry, I used a washable glue stick to glue pieces of blue fabric onto the back of the white panels and stitch them together. 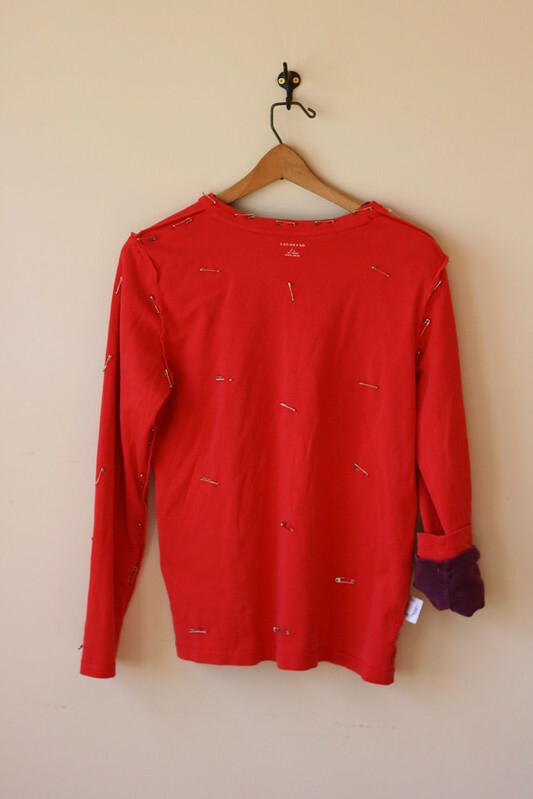 I used red button/craft thread for the stitching and decided to leave my knots on the outside as a design-element. The little tails of the knots make me think of trees in spring. 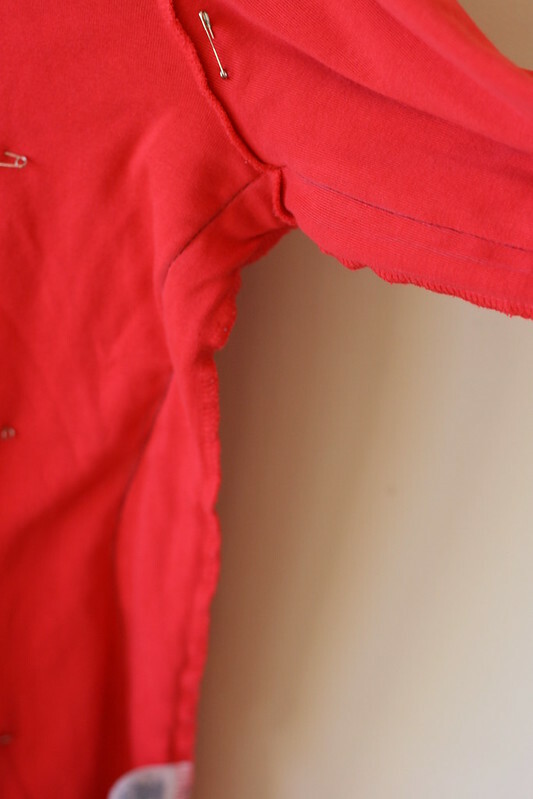 My hand stitching isn’t regular and even yet, but that wasn’t something that I was going for with this piece and, like the shirt I showed you recently, I thought this was a good chance to practice. If I had this to do over again, I’d have planned the back out a bit better. I have some longer pieces that stick out because that’s where I pieced two scraps of fabric together. When I was trimming the back, I realized I couldn’t cut through them without things unraveling, but that fix is for another project. I often ask for wisdom, and one of my realizations that I think is wise (or helps me, at any rate) is that sometimes it’s better to have a project with imperfections that you actually finish and learn from than five or ten projects that never get finished because you can’t make them perfect. 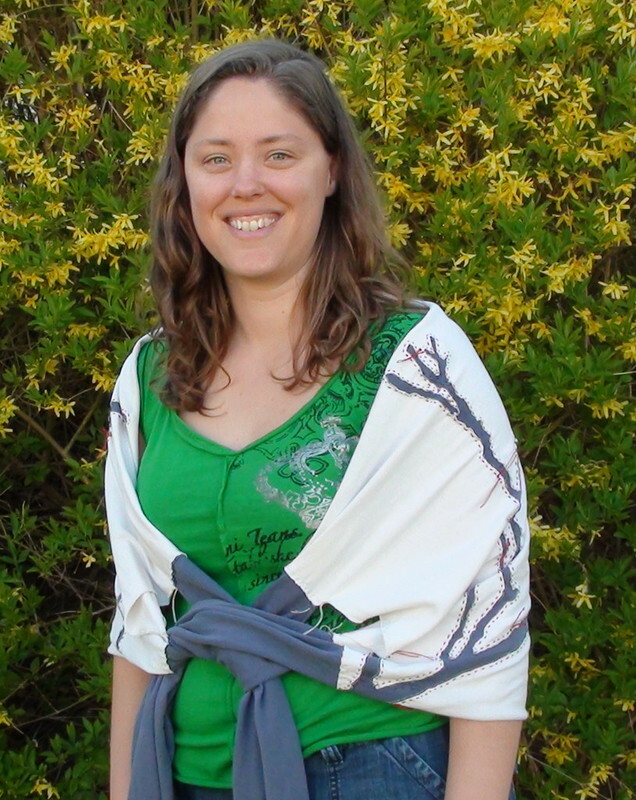 I put armholes in the wrap so that it would function as a cross between a wrap and a long, drapey sweater. So there you have it. 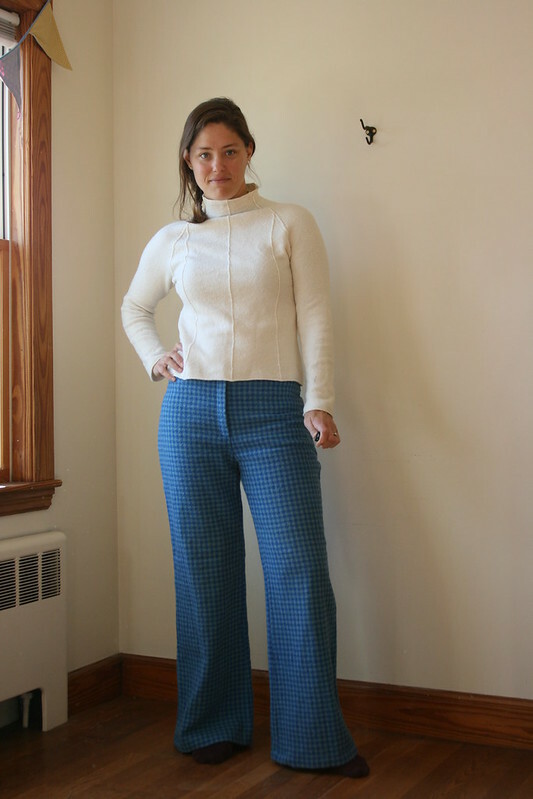 I find Natalie Chanin’s clothing concepts so freeing (Actually, the shirt I’m wearing above is one of my “cheater” Alabama Chanin clothing items–her pattern, but I sewed it on a machine.). 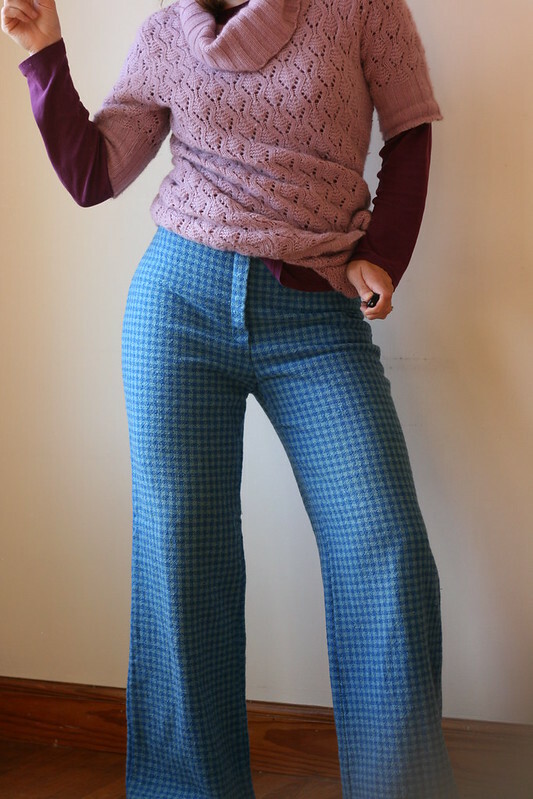 Knit is very forgiving, and if you work in smaller pieces like this, you can recycle old t-shirts to create something beautiful out of something that was going to be thrown away. Hello, Blogland! And welcome, Readers, to Pattern and Branch. Let’s get started! I hope that we can inspire each other to new acts of creativity, artwork, and craftsmanship. I look forward to meeting you. If you’d like to know a bit more about me and the focus of the blog, you can visit my About page. For our inaugural post, I thought I would share with you my latest project, which took me several months to complete: a dress to wear to my cousin’s wedding. The challenge I gave myself was to create a party-style dress out of a completely different fabric than what was called for, hopefully adding comfort, flexibility (thanks to knit fabric), and a unique touch. This garment came about through several of my recent influences and interests, specifically The Party Dress Book by Mary Adams, where I got my pattern, and the Alabama Chanin books, where I found many of the techniques I used (Alabama Stitch Book, Alabama Studio Style, and Alabama Studio Sewing + Design). For the bodice, I used three layers of fabric to add stability and also so that I could do more than one layer of reverse applique. 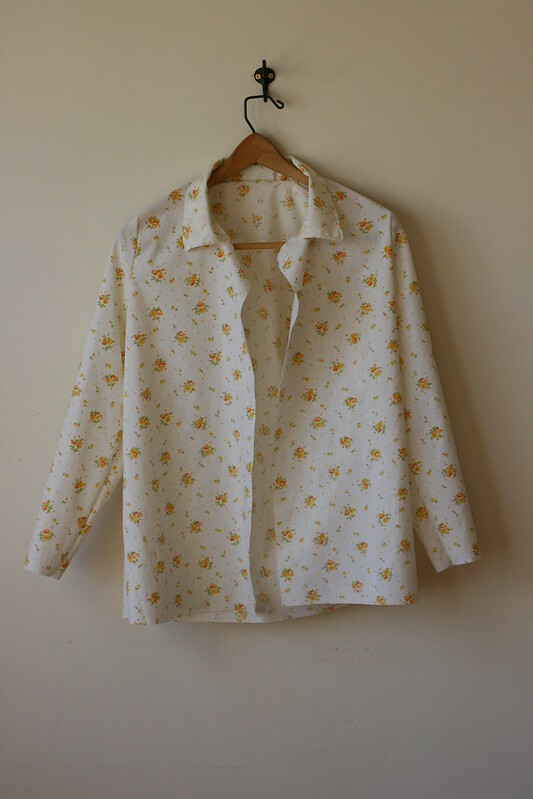 Originally, I had in mind a coral motif, but after several revisions, I found my inspiration in a shirt I saw fabric designer Anna Maria Horner wearing on a pattern instruction video. 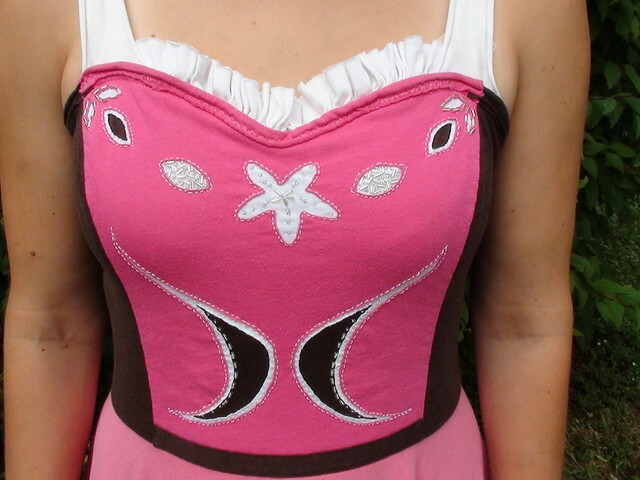 I decided to decorate the bodice piece by piece so that it could be “finished” at whatever point I ran out of time. In the future, I may add more details to the dress. The skirt is two layers since I had planned (or at least wanted the option of) an all-over design. There was some unforseen stretching of the underlayer after construction, but when it’s on, you don’t really notice it. The dress feels heavy to hold, but is comfortable when worn. At some point, the straps will have to be reworked. 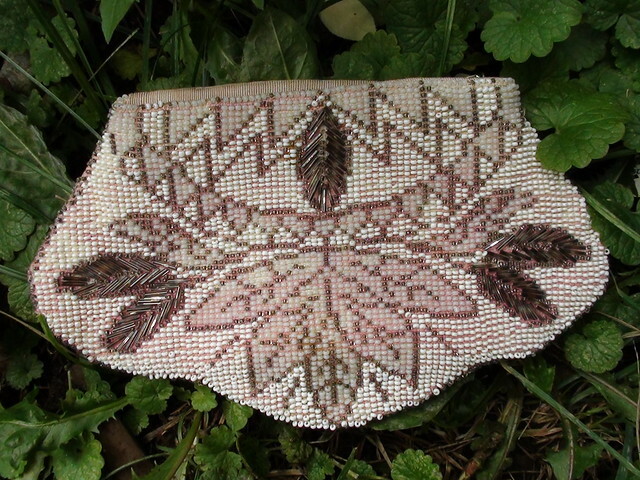 I’m still learning a lot about grainlines in fabric. I think the white knit that lies over the grosgrain ribbon needs to be cut in the opposite direction and redone. 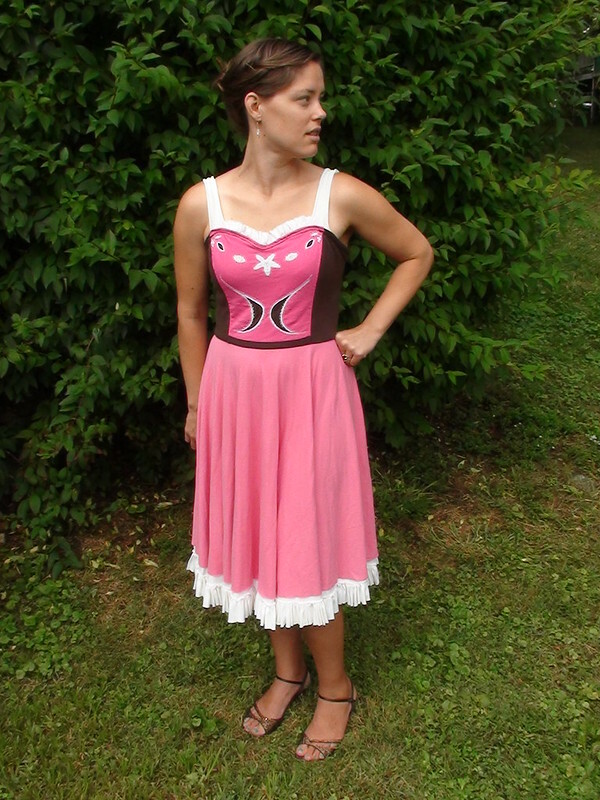 Here is the not-so-secret best part: this dress probably cost me somewhere in the neighborhood of $10 to make. Know why? 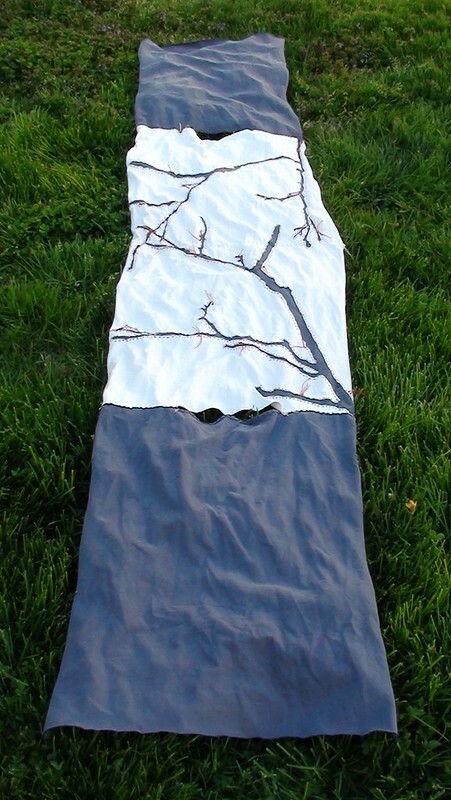 It’s made out of sheets–knit sheets. Incorporating a surprising element in a design is something I really enjoy. 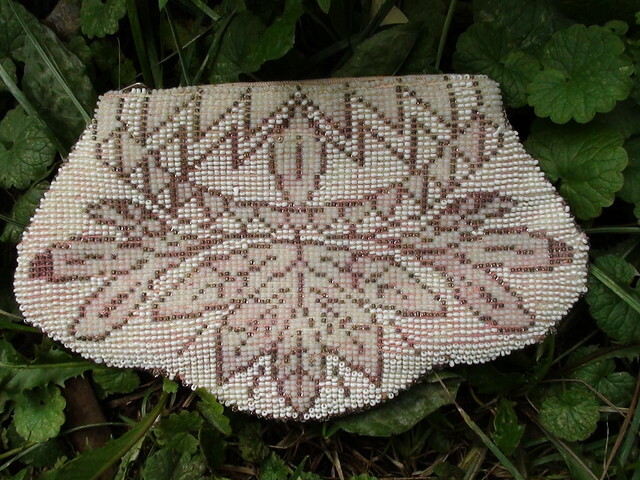 I even found a cute vintage beaded purse to go with it. What about you? What are your current design influences? 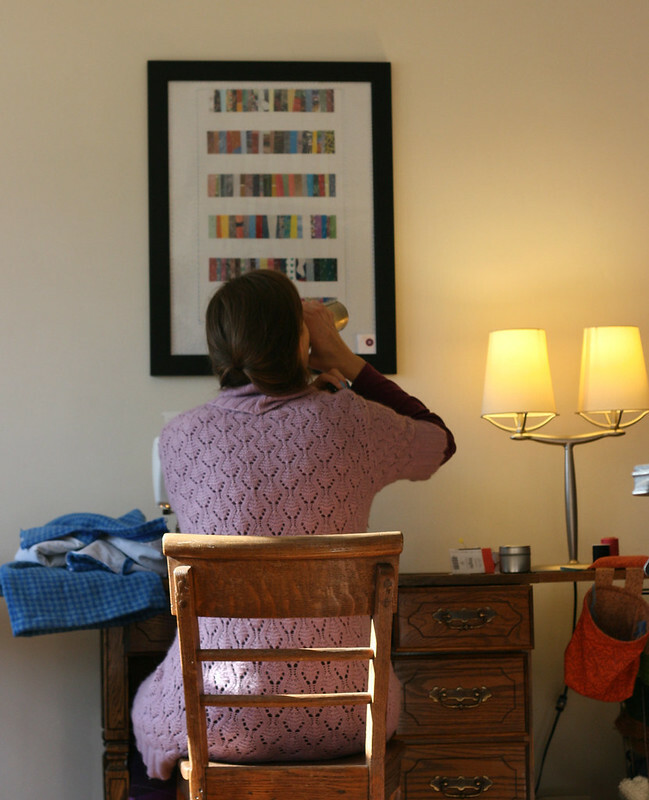 What surprising elements do you like to add to your work? I’d love to hear about them!